I recently watched American Horror Story for the first time (Oh my goodness I am obsessed, I binge watched all the seasons). But after having finished the first season I was having a craving for understanding the mind of a serial killer. And I didn't want it to be Criminal Minds-esque where someone else was analyzing them. 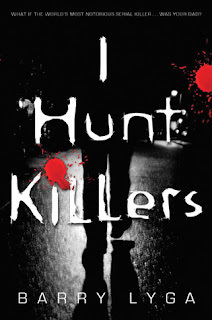 I wanted to be in the killer's head, and I wanted to feel something more than fear or disgust. Holy Moly did this book hit the spot. I was scared and grossed out and totally compelled to like the characters. I am a wimp though and struggled with showering by myself after reading it, for fear of someone on the other side of the curtain. Jasper "Jazz" Dent is a likable teenager. A charmer, one might say. But he's also the son of the world's most infamous serial killer, and for Dear Old Dad, Take Your Son to Work Day was year-round. Jazz has witnessed crime scenes the way cops wish they could—from the criminal's point of view. I mostly read this book during slow hours at work (I know, I am bad). It totally sucked me into the story. Jazz is a teenager who was raised by his serial killer father, to be a serial killer. He is constantly fighting the urge to give in to all that his father filled his head with, and there are graphic details of all the things he stops himself from doing. He is accompanied by his best friend and girlfriend, both of whom help brighten up what would have other wise been a very very dark story. I really learned to like Jazz, he is prickly and really messed up, but he is a solid character that I looked forward to finding new things about who he was. This story really makes you think. Really makes you wonder about murder and nature vs. nurture, and when Jazz struggles with it all, you are doing it right along side him. Now, like I said before, I am a major wimp, I am scared of everything, so that being said, this book is not for the faint of heart. It took me a few days to get out of that head space, and not without some serial killer dreams. I think this was a very well written, and very well researched book. If you like this genre, then this is definitely a much read!